I am Okey Ogbu, the chairman Actors Guild of Nigeria, Kano chapter. Can you explain to us how AGN came to Kano? For quite some time now, AGN as a body has been existing in kano but it was so unfortunate that people at the helm of affairs then were not working hard to project the image of AGN in kano. That is why it seemed as if AGN was not in existence but for now we are out to ensure people understand that AGN really exists in Kano State. When exactly did you take off? We had our first election about ten years ago that was in 1994 but after that tenure, the association became crisis ridden because of leadership problem, they could not achieve anything. After this recent election things are now going normally. I would like to thank my council because they are working very hard, they are really committed. It is just some few months after the election things started moving smoothly again; they are really working. The result will start coming out any moment from now. As members of AGN, and actors as well, are you shooting in Kano? If yes, can you give us examples of some of your activities? Yes, we have been shooting in Kano and Kano as a chapter have all the rights to shoot in Kano because this is an actors' guild and AGN is all about movie-making. We have shot some films, previously including Police at Work, Desperate Desire and more recently the Trigger. Now we learnt of a new leadership at the guild, as the newly elected chairman, what is your ambition for the association? I have a very tall ambition. My ambition is that I want to propel AGN so that the people will really know that artists exist in Kano. You will find out that the only popular artists here are those from other parts of the country from Lagos and Enugu. We want to show that there are equally good actors in Kano. My duty as state chairman is to project the image of the artists living in kano so that the people will know that they are hardworking and can even equal their counterparts in other parts of the country. 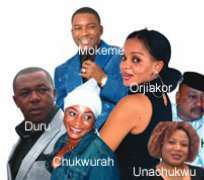 What is your relationship with other chapters of AGN in the country especially the movie industry in Lagos and Onitsha? Our relationship is very cordial. Recently, immediately after our election, we went for national/state chairmen meeting in Awka which I attended. We interacted well with other officials, so our relationship with other chapters especially those in Enugu and Lagos is good and I also work closely with other state chapters. Has any of your members been invited to Lagos or Onitsha to participate in some movies? Yes, some of them were invited though very few of them. That is why we are trying to see that we project ourselves for the world to know we exist. You know in things like this you have to let people know you exist. We present and we want people know that there are artists in Kano. There is a Hausa movie industry in Kano called Kannywood. Do you have any relationship with them? Yes, we have a very close relationship with them because last year we participated in Iyan-Tama's movie, "Tsintsiya", it is a Hausa film and there is another one which is yet to come to the market. We were invited so we have a very good close relationship with the Hausa movie industry. How do you see the prospects of AGN in Kano? It is very bright because of the kind of vision we have and the spirits my exco have. We have a very tall ambition; I want to tell you that by the time our tenure expires, we will live a landmark in Kano AGN. Do you have some production companies that are currently working on some movies? Yes, we have them; we have some of them really working. In Kano, there is censorship especially of the Hausa films. I don't know whether you have come into contact with the censorship authorities and whether you have any relationship with them. We met with the censorship board last year and we are still discussing with the director general. There are some documents that he asked us to submit to his office which we have already submitted. We are still working out modalities of maintaining a cordial relationship with them. You know nobody is an island, we need each other's support since they are working in Kano, we shall cooperate with them. Has there been some requirement that they have demanded from you as artists or the industry? One of the requirements is, initially they said on artists should register with them. You know it would not be possible. Our own ideas is to register with them as a body and not the artists registering themselves because they work with body and not with individuals. That alone is not needed because you cannot say that. As a medical doctor, the only need is to register Nigerian medical association, the minister of health or my body will not come to you and ask you to register a member individually. In our own case, the actors guild of Nigeria is the only body to register itself with the censors board. Has the censorship agreed with his your stand? Actually, we have not concluded. We are still moving attempt to go back to them and see what we can do. Did the AGN register with the Kano censorship board? We applied. We have applied last year, the registration has not been concluded but we hope as things go new we will go back to them to conclud it. But has those been something like submitting films for vetting or censorship? Yes, last time when we had a script they said we should submit the script to them so that they will vet it. We agreed with that. So far do you have any problem with the censorship board? We don't have any problem with the censorship board. We want a situation whereby we can work in a mutual relationship with them. Have you ever invited Hausa film actors for your shootings? Yes, we did and you know this is not something that comes every time. If there is anybody we need, we will invite them. We are working together, all of us are artists and as an artist you are not limited to a particular area. You take your expertise to everywhere and that is really what we want to do. In Hausa film industry if we need someone we shall invite him to act for us. If the Hausa film industry needs one of us, he can go and act for them. So that is about living in harmony and unity, working in close relationship. What is your call on the artistes in general and your Hausa film industry counterpart? My call to them is that when we talk about movie, movie is about projecting what is happening in the society and with them (Kannywood) and the English AGN, we can work closely to project what the society requires. I am not referring to the negative aspects of it. We want to work closely so that things can be orderly in the movie industry.